The Gabonese Republic or Gabon, is a nation of west central Africa. Since its independence from France in 1960, the republic has been ruled by only two presidents, both autocratic; the incumbent, Omar Bongo, has been in power since 1967 and as of 2007 was Africa's longest-serving head of state. In response to unrest, Bongo introduced a multiparty system and a new democratic constitution in the early 1990s that allowed for a more transparent electoral process and for reforms of governmental institutions. But the government manipulated the process to remain in power. Bongo is believed to have funneled millions into bank accounts abroad. A small population, abundant natural resources, and foreign private investment have helped make Gabon one of the more prosperous countries in the region. It contains some of the most pristine tropical rainforests on earth and the government is setting up a system of national parks with the hope of attracting ecotourism to reduce dependence on logging. The initiative takes on greater urgency as the country's oil production is declining. Gabon is turning to China for financial aid and development of its minerals. Gabon borders on Equatorial Guinea, Cameroon, Republic of the Congo and the Gulf of Guinea. Gabon is located on the Atlantic coast of central Africa. The climate is hot and humid with heavy rainfall. Lowlands extending inland from the coast lead to densely forested plateaus in the east and south that range in altitude from 1,000 to 2,000 feet. Rounded mountains in the interior reach heights of 5,200 feet. Gabon's largest river is the Ogooué. Its forests are renowned for their huge diversity in plant species—among the richest in Africa—from the mangroves of the coast to the spectacular savannas of the Bateke Plateaus. It is also rich in animals that are threatened or poorly represented at continental or regional levels. Its fauna include elephants, gorillas, and hippopotamus. In 2002, the government announced it would set aside ten percent of its landmass for a system of national parks. Gabon's President El Hadj Omar Bongo said 13 national parks comprising more than 10,000 square miles will be established, protecting vital habitat for gorillas, chimpanzees, forest elephants and other wildlife. Much of the land set aside was based on years of field research by the Wildlife Conservation Society, which has studied Gabon’s wildlife since 1985. National Geographic magazine drew attention to Gabon's extraordinary biological wealth while filming and photographing WCS Conservationist Mike Fay's “Megatransect”—a joint expedition between WCS and National Geographic across the Congo Basin forest. Many of the new parks will be developed for ecotourism, as an economic alternative to exploiting Gabon’s forests for timber. "By creating these national parks, we will develop a viable alternative to simple exploitation of natural resources that will promote the preservation of our environment. Already there is a broad consensus that Gabon has the potential to become a natural "Mecca," attracting pilgrims from the four points of the compass in search of the last remaining natural wonders on earth," President Bongo said. The lowest point is the sea level coast. The highest point is Mont Iboundji (1,575 m). Natural resources include petroleum, natural gas, diamonds, niobium, manganese, uranium, gold, timber, iron ore, and hydropower. Only 1.21 percent of the land is arable. The main food crops are cassava and plantains. Environmental issues facing the country are deforestation and poaching. During the last seven centuries, Bantu groups arrived in Gabon from several directions to escape enemies or find new land. Little is known of tribal life before European contact, but tribal art suggests a rich cultural heritage. Gabon's first confirmed European visitors were Portuguese traders who arrived in the fifteenth century and named the country after the Portuguese word gabao—a coat with sleeve and hood resembling the shape of the Komo River estuary. The coast became a center of the slave trade. Dutch, English, and French traders came in the sixteenth century. France assumed the status of protector by signing treaties with Gabonese coastal chiefs in 1839 and 1841. American missionaries from New England established a mission at Baraka (now Libreville) in 1842. In 1849, the French captured a slave ship and released the passengers at the mouth of the Komo River. 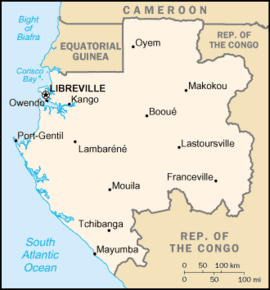 The slaves named their settlement Libreville (French for "free town"). French explorers penetrated Gabon's dense jungles between 1862 and 1887. The most famous, Savorgnan de Brazza, used Gabonese bearers and guides in his search for the headwaters of the Congo River. France occupied Gabon in 1885, but did not administer it until 1903. In 1910, Gabon became one of the four territories of French Equatorial Africa, a federation that survived until 1959. The former territories all became independent in August 1960—as Chad (August 11), the Central African Republic (August 13), Republic of the Congo (August 15), and finally Gabon on August 17. At the time of Gabon's independence, two principal political parties existed: the Bloc Democratique Gabonais (BDG), led by Leon M'Ba, and the Union Democratique et Sociale Gabonaise (UDSG), led by J. H. Aubame. In the first post-independence election, held under a parliamentary system, neither party was able to win a majority. The BDG obtained support from three of the four independent legislative deputies, and M'Ba was named prime minister. Soon after concluding that Gabon had an insufficient number of people for a two-party system, the two party leaders agreed on a single list of candidates. In the February 1961 election, held under the new presidential system, M'Ba became president and Aubame became foreign minister. In March 1968, Bongo declared Gabon a one-party state by dissolving the BDG and establishing a new party: the Gabonese Democratic Party (Parti Démocratique Gabonais) (PDG). He invited all Gabonese, regardless of previous political affiliation, to participate. Bongo was elected president in February 1975; in April 1975, the office of vice president was abolished and replaced by the office of prime minister, who had no right to automatic succession. Bongo was re-elected president in December 1979 and November 1986 to seven-year terms. Using the PDG as a tool to submerge the regional and tribal rivalries that divided Gabonese politics in the past, Bongo sought to forge a single national movement in support of the government's development policies. Opposition to the PDG continued, however, and in September 1990, two coup d’etat attempts were uncovered and aborted. Despite anti-government demonstrations after the untimely death of an opposition leader, the first multiparty National Assembly elections in almost 30 years took place in September-October 1990, with the PDG garnering a large majority. Following President Bongo's re-election in December 1993 with 51 percent of the vote, opposition candidates refused to validate the election results. Serious civil disturbances led to an agreement between the government and opposition factions to work toward a political settlement. These talks led to the Paris Accords in November 1994, under which several opposition figures were included in a government of national unity. This arrangement soon broke down, however, and the 1996 and 1997 legislative and municipal elections provided the background for renewed partisan politics. The PDG won a landslide victory in the legislative election, but several major cities, including Libreville, elected opposition mayors during the 1997 local election. President Bongo coasted to easy re-elections in December 1998 and November 2005, with large majorities of the vote against a divided opposition. While Bongo's major opponents rejected the outcome as fraudulent, some international observers characterized the results as representative despite any perceived irregularities. 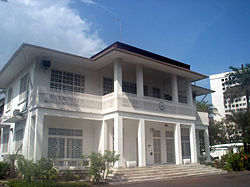 Legislative elections held in 2001-2002, which were boycotted by a number of smaller opposition parties and were widely criticized for their administrative weaknesses, produced a National Assembly almost completely dominated by the PDG and allied independents. 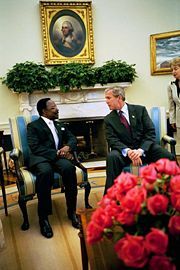 President Omar Bongo Ondimba with President George Bush in Washington, D.C. USA. In 1991 a new constitution was adopted. Among its provisions are a Western-style bill of rights, the creation of the National Council of Democracy that also oversees the guarantee of those rights, and a governmental advisory board that deals with economic and social issues. Multi-party legislative elections were held in 1990-1991 even though opposition parties had not been declared formally legal. President Bongo, in power since 1967, was re-elected to another seven-year term according to poll results returned from elections held in 2005. According to figures provided by Gabon's Interior Ministry, this was achieved with 79 percent of the votes cast. In 2003 Bongo amended the national constitution to remove any restictions on the number of terms a president is allowed to serve. The president retains strong powers, such as the authority to dissolve the National Assembly, declare a state of siege, delay legislation, conduct referenda, and appoint and dismiss the prime minister and cabinet members. In provisional results his ruling Gabonese Democratic Party (PDG) won 84 out of 120 parliamentary seats. As with previous Gabonese elections in which the opposition parties have contested, there were several accusations of electoral fraud, bribery, and calls for a boycott. There were also incidences of violence and protest, particularly in the first round of voting held two weeks prior. Allegations of electoral fraud during local elections in 2002-03 and the presidential elections in 2005 have exposed the weaknesses of formal political structures in Gabon. Gabon's political opposition remains weak, divided, and financially dependent on the current regime. The Parliament has two chambers. The National Assembly has 120 members, 111 members elected for a five-year term in single-seat constituencies and nine members appointed by a head of state - the president. The Senate has 91 members, elected for a six-year term in single-seat constituencies by local and departmental councillors. Gabon has followed a nonaligned policy, advocating dialogue in international affairs and recognizing both parts of divided countries. In inter-African affairs, Gabon espouses development by evolution rather than revolution and favors regulated free enterprise as the system most likely to promote rapid economic growth. Concerned about stability in Central Africa and the potential for intervention, Gabon has been directly involved with mediation efforts in Chad, the Central African Republic, Angola, Republic of Congo, the Democratic Republic of Congo, and Burundi. In December 1999, through the mediation efforts of President Bongo, a peace accord was signed in Republic of Congo/Brazzaville between the government and most leaders of an armed rebellion. Bongo has remained involved in the continuing Congolese peace process and has also played a role in mediating the crisis in Cote d'Ivoire. Gabon has been a strong proponent of regional stability, and Gabonese armed forces played an important role in the Central African Economic and Monetary Community (CEMAC) mission to the Central African Republic. Gabon is a member of the the Organization of the Islamic Conference; and the Nonaligned Movement. Gabon withdrew from the Organization of Petroleum Exporting Countries (OPEC) in 1995. Equatorial Guinea and Gabon have a sovereignty dispute over Gabon-occupied Mbane Island and lesser islands and need to establish a maritime boundary in hydrocarbon-rich Corisco Bay. Gabon's economy is dominated by oil. Oil revenues comprise 65 percent of the government's budget, 43 percent of gross domestic product (GDP), and 81 percent of exports. Gabon's oil revenues have given it a strong per capita GDP of $7,200, extremely high for the region. On the other hand, a skewed income distribution and poor social indicators are evident. The richest 20 percent of the population receives over 90 percent of the income, and about a third of Gabonese live in poverty. Oil production is now declining rapidly from its high point of 370,000 bpd in 1997. Despite the decreasing oil revenues, little planning has been done for an after-oil scenario. Public expenditures from the years of significant oil revenues were not spent efficiently. Overspending on the Transgabonais railroad, the oil price shock of 1986, the CFA franc devaluation of 1994, and low oil prices in the late 1990s caused serious debt problems. Gabon has earned a poor reputation with the Paris Club and the International Monetary Fund (IMF) for the management of its debt and revenues. Successive IMF missions have criticized the government for overspending on off-budget items (in good years and bad), over-borrowing from the Central Bank, and slipping on the schedule for privatization and administrative reform. The economy is highly dependent on extraction of abundant primary materials. After oil, logging and manganese mining are the other major sectors. Foreign and Gabonese observers have consistently lamented the lack of transformation of primary materials in the Gabonese economy. Various factors have so far stymied more diversification—a small market of about one million people, dependence on French imports, inability to capitalize on regional markets, lack of entrepreneurial zeal among the Gabonese, and the fairly regular stream of oil "rent." The small processing and service sectors are largely dominated by just a few prominent local investors. At World Bank and IMF insistence, the government embarked on a program of privatization of its state-owned companies and administrative reform, including reducing public-sector employment and salary growth, but progress has been slow. An estimated 40 percent of people are unemployed in Gabon, despite Gabon's oil, gold, manganese, and ore. The United Nations says that between 60 and 70 percent of the population live below the poverty line, scraping by on less than U.S. $1 per day. Gabon was instrumental in forming the Central Africa Economic and Monetary Community (CEMAC), a consortium of six nations hoping to merge their macroeconomic policies and create a common market. The movement culminated in the creation of the Gulf of Guinea Commission, established in 2000 to encourage settlement of conflicts threatening natural resource development. Most industry is petroleum related, wood processing, food and beverage processing. The major markets are the United States 53 percent, China 8.5 percent, France 7.4 percent, EU, Asia. Imports (of construction equipment, machinery, food, automobiles, manufactured goods) mainly come from France 43 percent, the U.S. 6.3 percent, United Kingdom 5.8 percent, Netherlands 4 percent. Almost all Gabonese are of Bantu origin. Gabon has at least 40 ethnic groups with separate languages and cultures. The largest is the Fang. Others include the Myene, Bandjabi, Eshira, Bapounou, and Okande. Ethnic group boundaries are less sharply drawn in Gabon than elsewhere in Africa. French, the official language, is a unifying force. More than 10,000 French nationals live in Gabon, and France dominates foreign cultural and commercial influences. Historical and environmental factors caused Gabon's population to decline between 1900 and 1940. It is one of the least-densely inhabited countries in Africa, and a labor shortage is a major obstacle to development and a draw for foreign workers. Most inhabitants are Christians (with estimates of the Christian population ranging from 55 to 75 percent), mostly members of the Roman Catholic Church. Other religious groups include animists, Muslims, and practitioners of indigenous African religions. Life expectancy is 54 years (males 52.85 years and females 55.17 years, according to a 2007 est.) About 60 percent of the population is engaged in agriculture, 15 percent in industry, and 25 percent in services. Petty thievery is common. Violent crime is more common in urban areas. The HIV/AIDS prevalence rate among adults is 8.1 percent (2003 estimate). Gabonese music is little-known in comparison with regional giants like the Democratic Republic of Congo and Cameroon. The country boasts an array of folk styles, as well as pop stars like Patience Dabany (who now lives in the United States). Dabany's albums, though recorded in Los Angeles, have a distinctively Gabonese element and are popular throughout Francophone Africa. Other major musicians include Pierre-Claver Akendengue (considered a master-poet), "the veteran" Mackjoss, Vickos Ekondo, known as "the king of Tandima." Also known are guitarists like Georges Oyendze, La Rose Mbadou and Sylvain Avara, and the singer Oliver N'Goma. Imported rock and hip hop from the United States and United Kingdom are popular in Gabon, as are rhumba, makossa and soukous. Gabonese folk instruments include the obala, the ngombi, balafon and traditional drums. Gabon also features highly appreciated masks, such as the n'goltang (Fang) and the relicary figures of the Kota. Humanitarian News and Analysis. GABON: Poverty amid plenty as unemployment booms. Retrieved June 23, 2007. British Broadcasting Coorporation. Country Profile - Gabon. African Studies Center. Gabon Page. This page was last modified on 16 May 2017, at 19:27.